This class covers the basics. Students will work on a sampler with stippling, looping, and curvy crosshatching. Nancy will offer instruction in basic free motion quilting on a domestic machine. The skills learned can also be used on sit down quilting machines such as the Baby Lock Tiara. Prepare machine for successful free motion. Choose quality threads and needles for success in quilting. Choose batting to complement the design. Prepare your project batting and backing with spray baste. Make sample blocks with various motifs. Check and maintain an appropriate tension. Form beautiful designs from a five simple shapes and movements. Stipple (small, medium, and large). Loopy meandering and curvy crosshatching. 8 practice sandwiches (sixteen 14”x 14” square pieces of muslin or solid cotton of any color, 8 pieces batting of your choice cut in 14” squares. RELAX. 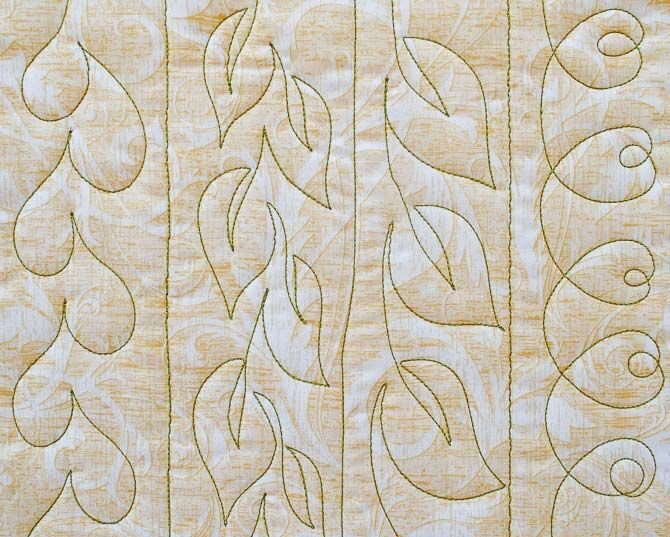 Take a deep breath--you can do free-motion quilting!